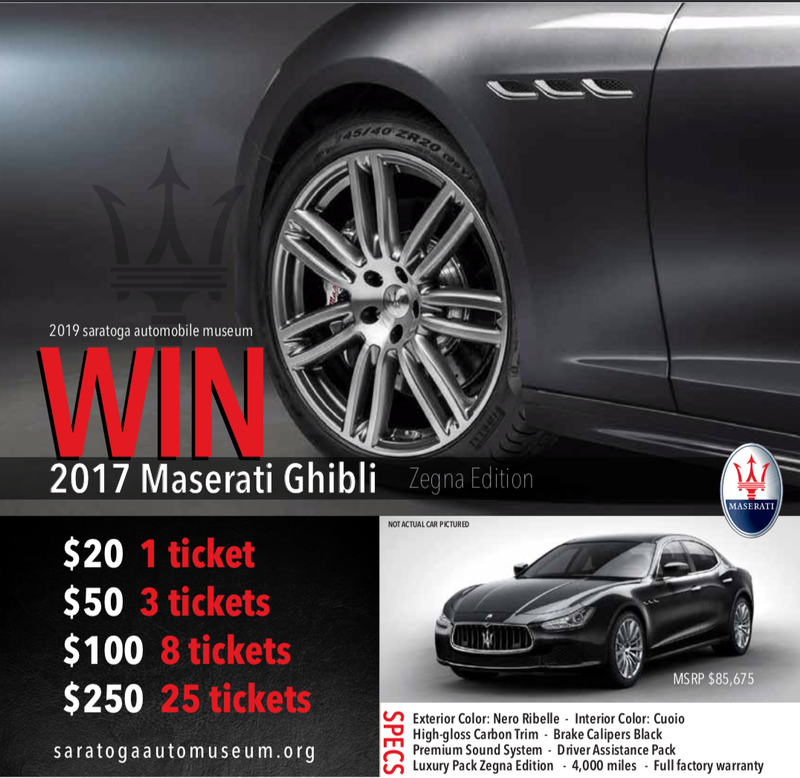 SARATOGA SPRINGS, N.Y. (April 9, 2019) — The Saratoga Automobile Museum’s 2019 sweepstakes, sponsored by Maserati of Albany, will run until Sunday, Sept. 22 at 2 p.m. when the winner will be selected. The winner of the sweepstakes need not be present to win, and no purchase is necessary to enter the sweepstakes. The grand prize is a 2017 Maserati Ghibli, Zegna Edition. The exterior color of the sports car is Nero Ribelle and the interior color is Cuoio with a high-gloss carbon trim and black brake calipers. Other features include a premium sound system, driver assistance, and a full factory warranty with 4,000 miles. Manufacturer’s suggested retail price for this vehicle is $85,675. Sweepstakes ticket prices are as follows: one ticket for $20, three tickets for $50, eight tickets for $100, and 25 tickets for $250. Entrants can earn a chance to win, in person at the Museum, via phone by calling the Museum at (518) 587–1935, via the Museum’s website, saratogaautomuseum.org, or by mail to 110 Avenue of the Pines, Saratoga Springs. For more information and full official sweepstakes rules, visit saratogaautomuseum.org.